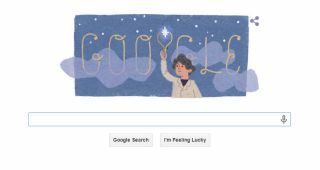 Google turned its eyes to stars today — the front-page Google doodle is an illustration in honor of the 151st birthday of Annie Jump Cannon, the astronomer who came up with the modern system for classifying stars. Born in 1863, Cannon had an insatiable appetite for astronomy: she studied and classified hundreds of thousands of stars in her lifetime. The star classification system she devised — still used today — consists of 7 categories, each indicated by a letter: O, B, A, F, G, K, M. Students of astronomy will remember the mnemonic device to recall these letters: "Oh, Be A Fine Gal/Guy — Kiss Me!" In Cannon's system, our sun is a G star, which indicates a star with a yellowish or whitish color. OB stars are bluer, while most M stars have a reddish hue (two additional letters were later added for even redder stars). A star's color is determined by its composition, and astronomers can use the light from a star to get a detailed list of the chemical elements the star is made of. Cannon's system has since been expanded, so our sun's full classification label is a G2V star, with 2 acting as an indicator of its temperature and V an indicator of its luminosity. Cannon retired in 1940 at the age of 76, and died on April 13, 1941.